Hong Kong is set to release updated unemployment figures in the week ahead, as market participants continue to eye developments in the region’s debt and currency markets. Labor market conditions in HK have been squarely in positive territory, underscored by the lowest rate of unemployment in at least 20 years. Meanwhile, recent U.S.-China trade tensions, as well as changes in central bank monetary policy strategies, have had many investors somewhat jittery about HK’s local currency and bond markets. Against this backdrop, investor sentiment in HK’s debt market is likely to improve, amid the U.S. Fed’s recent pullback from its tightening stance. However, the HK dollar has recently weakened against the U.S. dollar after gaining ground from its lows in March. Labor market conditions in HK have been squarely in positive territory, underscored by the lowest rate of unemployment in at least 20 years. 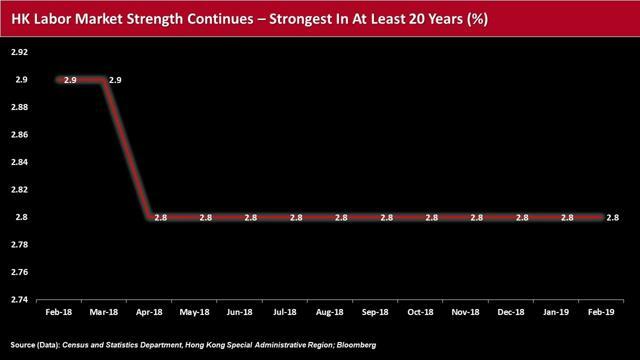 At 2.8%, HK has maintained the smallest jobless population since April 2018, with dramatic improvement from its two-decade peak of 8.5% reached in June 2003. Investors will receive updated unemployment figures for March on Thursday, April 18, after the prior month held steady at the 2.8% rate. Indeed, for most of 2018, the U.S. Federal Reserve’s hikes in interest rates and quantitative tightening measures generally spurred capital outflows from emerging markets and hampered global debt performance. The effects were exacerbated by headwinds such as uncertainties over U.S.-China trade negotiations, coupled with slowing growth in China’s Mainland economy. According to the Hong Kong Monetary Authority (HKMA), the total volume of HK dollar (HKD)-denominated debt issuance rose, mainly due to an uptick in exchange fund bills and notes, along with the government’s support of the bond market. The HKMA noted that since the global financial crisis, “a massive amount of funds” have flowed into the Hong Kong dollar. However, in 2018, there were signs of capital outflows, notably in the second and third quarters – triggering higher HKD interest rates across the board, and an upward trend in the government bond yield curve, as the aggregate balance declined. HKMA observed that the negative yield spread between U.S. Treasuries and Hong Kong government bonds narrowed, which lured more investors towards local currency debt. During this time, HKD bond offerings shot higher for the 10th consecutive year to HKD 3.56trn, a rise of 6.6% over 2017, with local corporate debt market funding having boosted by 35% over the same period. Against this backdrop, investor sentiment in HK’s debt market may well improve, amid the U.S. Fed’s recent pullback from its tightening stance. The Fed’s decisions to maintain the target range for the federal funds rate at 2.25-2.5%, with no plans in 2019 to hike interest rates further, as well as cease other quantitative tightening measures, including ending its US$4trn balance sheet shrinkage in September, had spurred a plunge in U.S. government bond yields and generally reignited interest in riskier assets. For the week ended April 3, Thomson Reuters/Lipper U.S. Fund Flows reported a net inflow of roughly US$135m into emerging market equity funds, contributing to a whopping total of around US$18bn this year, while at the end of March, more than US$1bn worth of inflows reportedly made their way into EM debt funds year-to-date. 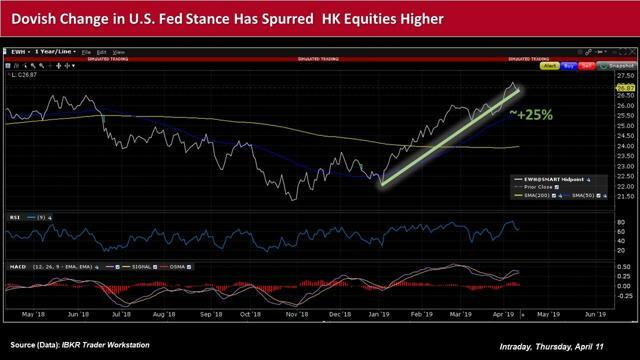 Hong Kong equities – as evidenced by the iShares MSCI Hong Kong ETF (NYSEARCA: EWH), which has among its top holdings life insurance giant AIA Group (OTCMKTS: AAGIY) and CK Hutchison (OTCMKTS: CKHUY) – have climbed almost 25% from their most recent 52-week low set in October 2018. The HKMA has been cautiously optimistic about the recent dovish tack at the U.S. Fed, and warns that uncertainties linger. However, Chan recently pointed out that as interest rate differentials between HKD and the U.S. dollar remain, incentives continue for funds to flow from HK local currency to the USD. By mid-March, the HKMA had intervened at least three times – to the tune of nearly HKD 7.5bn, or roughly US$1bn. 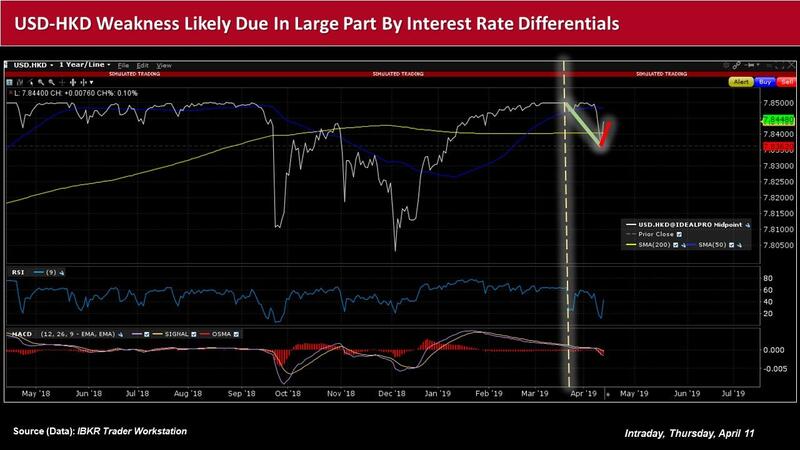 He continued that some market participants viewed the rally in Chinese mainland shares as “a cause of the Hong Kong dollar's woes, but interest rate differentials alone can explain its weakness. The HKD has recently weakened against the USD after gaining ground from its lows in March of around 7.849930, according to the IBKR Trader Workstation. The USD-HKD pair had hit around 7.836760 on April 10, only to sink back to roughly 7.8437 in intraday trading Thursday. More positive rhetoric on the U.S.-China trade front has also lent support for increased optimism among risk-takers. Deloitte’s China chief economist Sitao Xu recently said that the “likely resolution of U.S.-China trade talks has removed a major overhang for regional asset markets. As a result, much improved sentiment coupled with the U.S. Fed's much less hawkish stance have further fueled rallies in equity and property markets." Xu added that such “a relatively favorable macro backdrop should bring social issues to the fore. “The Hong Kong SAR government is still in a good fiscal position and is able to use fiscal levers to help SMEs and even jumpstart certain sectors like fintech." Investors will likely be keeping an eye on any further fluctuations in HK’s debt and currency markets, amid further developments in U.S.-China trade, potential shifts in monetary policy, and other macro headwinds. Note: This material was originally published on IBKR Traders' Insight on April 11, 2019.